« Happy Birthday Twitter! .. Valuable or Waste of time? We thought we should put out a blog post dedicated to Facebook seeing as it has been going through a few major changes that will affect everyone that has a Facebook business page. If you haven’t embraced the changes they are due to be imposed on you on the 31st March. With over 1.8 million people using Facebook in Ireland we would suggest that every business should be being proactive about the platform. In this article we will take you through some of the business page changes and the impact of these. We will also discuss the running of competitions and how to generate more interest in your page. The biggest change of all will be the new Facebook philosophy – since the Initial Public Offering in February 2012 Facebook will now be under pressure to deliver financially for its investors. We will see the platform becoming more and more monetised and we predict that many of the tricks and gimmicks that we have all been using to boost our page fan numbers will be outlawed and in future if you want to do this you will have to advertise – pure and simple. Facebook need to start delivering for their investors and will have to manage the balance between maintaining a credible and enjoyable social platform and a place where advertising will be pushed more on all of us. This change of dynamic will affect how we use Facebook and the March changes are the first big hint of this. The whole look and feel of your Facebook business page (personal profile pages have already changed) will change totally on the 31st March and some of your previous features will not work any longer. You will need to do a few things to maximise the opportunities here. Besides some new visual changes a timeline has also been introduced where at a glance you can view a chronological history of posts on the page. Our view is that these changes if embraced properly will deliver an even more impactful page for your business. (For those of you operating your business from a personal page we would advise changing over immediately as this is not allowed – it is possible to convert from one to the other with friends coming across as fans). Your own key visual identity will be delivered by two key visuals. Your thumbnail will more than likely be your company logo and this appears on the bottom left of the main image that a viewer will see on your page. This should be 180 x 180 pixels in size. Every time the page owner makes a post this thumbnail will appear alongside the post. The main banner image is a new feature introduced by Facebook. It is referred to as a “cover” and it stretches above the thumbnail across the page. This image can be a maximum of 851 pixels wide by 315 pixels high. Facebook have very specific rules about the content of the “cover page”. It should be an image that captures the business as best as possible but must not include offers, contact details, web address or any “like” us text. The basic logic here is that this information is available elsewhere on the Facebook page. It is clear that the new rules prevent the business from advertising or encouraging the user to “like” the page on this cover page. Our design team are currently preparing new cover pages for a number of clients. 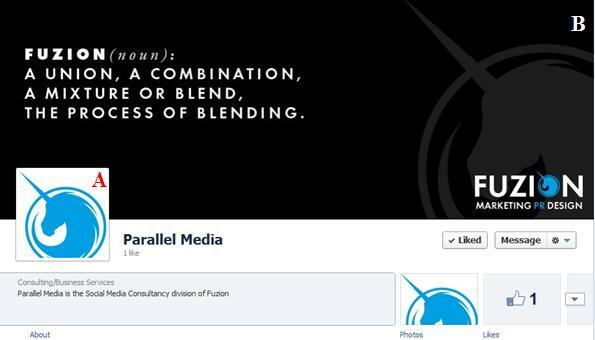 This is a really good opportunity to make your page stand out from competitor pages – grab it! Before it was possible to specify a “landing page” (see example below) that a new user on your business page was directed to when they first visited. 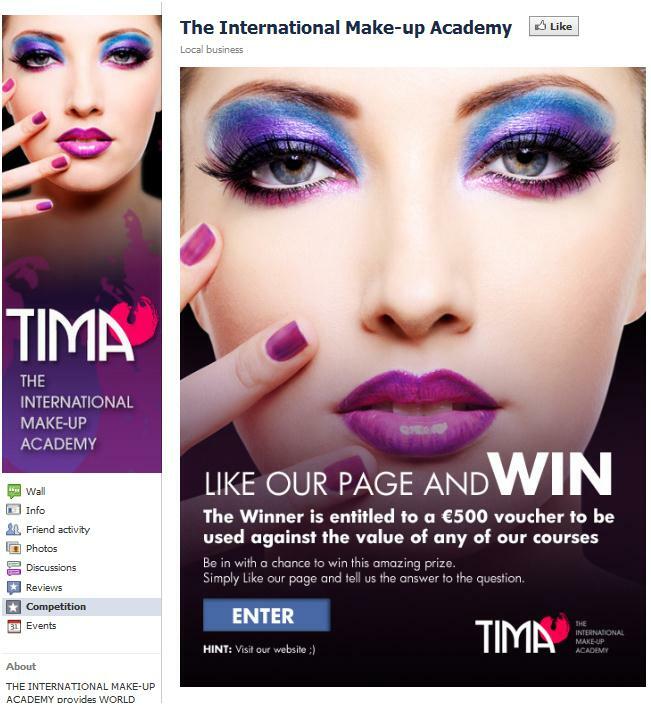 This was often a customised and highly visual promotional landing page, which encouraged likes, promoted the business or offered the user the opportunity to enter competitions. This is not possible now using the new layouts and these customised landing pages will be redundant. It is still possible to have a tab that will host competitions and promotions but you can no longer dictate that a user of the page will “land” on this page. The menu tabs that were available on the old format on the left hand side of the page are now displayed as tabs in the main display just below (see Starbucks example above) the new cover visual. It is only possible to display four tabs across the page. The other tabs/applications are available from the right of these displayed tabs by selecting the “down arrow”. At any time it is only possible to display a maximum of 12 tabs/applications. It is possible to select your own choice of tabs to display on the main page except for photos, which will always display first. You can do this by clicking on the “down arrow” which will display all the tabs. From here you can swap between tabs that you wish are displayed in the main view. You can post as normal but there are a few new features. Pinning a post – It is now possible to pin a post, which effectively means it will be featured and stay at the top of the page for 7 days. Other subsequent posts will appear below this post in the stream. This is done by selecting the “pin to top” option (see visual above) that is available to you at the top right corner of each post. You would use this to position your most important post at the top of a page for each new visitor to see first. Star post – when you “star” a post it will stretch across the full display instead of appearing on the left as a normal post. This will give that post more prominence on the page and it is very useful if you have posts with a lot of content. Hide/delete post – it is now possible to hide a post (& unhide after if required). When you hide a post it will still display in the “activity log” as a post. As before it is also possible to permanently delete a post. Change date of post – it is possible to alter the date of a post so that it will appear in a different position on your timeline. Milestone – it is now possible to create a “milestone” post, which is a way of marking special events in the life of the business such as a product launch or key event. This feature allows you to upload a photo and specific the milestone date. The display of your business page is totally customised for each user. When a user visits a business page their own friend’s activity with that page will appear on the right hand side (see Mad Men visual above) making their experience with the page more informed and personal. A user can view different aspects of the business page by choosing from the menu that appears at the top of the page once you start (see image below) scrolling down. From here the user can choose from the menu of Apps/tabs, choose from the timeline or select different types of highlights. The timeline can also be accessed directly from the time bar on the right hand side of the page. 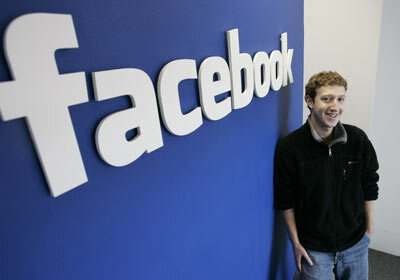 The messages facility is new to Facebook business pages and is a very significant development. Fans of the page can now send a “message” to the page directly if they want to communicate as an alternative to posting directly on the page (which would be visible to all users). These messages can be viewed and responded to in/from theadmin panel (top of your page). It is possible to shut off this feature preventing fans of the page to send messages. It is really important that messages are responded to promptly. There are a few new features worth mentioning. This is now a very tricky area for every business who has been building numbers of fans on their page by offering prizes. The facebook guidelines are quite strict and the new format, which cuts out landing pages where businesses have typically hosted competitions will make it even more difficult. The competition can be mentioned on the wall of the page but cannot be featured on the page. It would be an idea to mention the competition in a post and then to pin the post to the top of the page, keeping it there above other posts for at least 7 days. So – with all of these restrictions how can you build your numbers on your Facebook business page and really start engaging with fans? Without any big fancy tricks or gimmicks you need to give fans good reasons for coming onto your page. Maybe it will be ..
Because they are the first to learn about new products, events and sales? Because you operate a really great business and they want to express their thanks – a live testimonial! Its important that you achieve all of this through regular posts that are varied, visually interesting and not at all “spam like”. 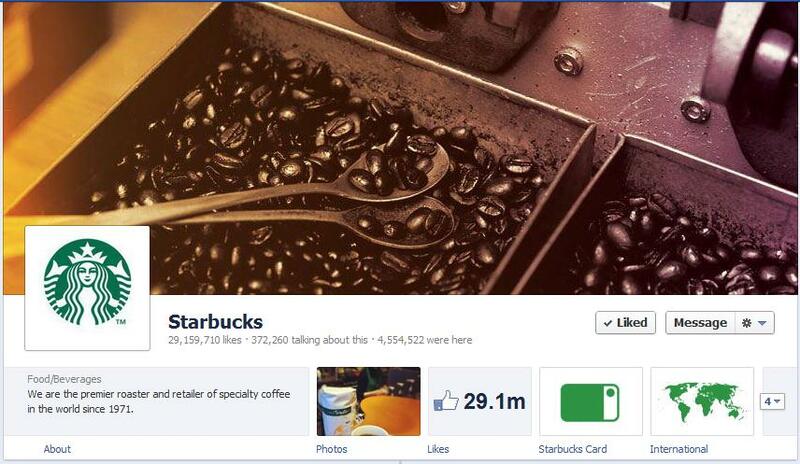 Over 29.2 million people “like” the Starbucks business page – that’s a lot of coffee drinkers! “Like” – If you want to boost your page numbers think of this simple word! While we are having this conversation why not Like the Fuzion Facebook page – we need to catch up with Starbucks! If you require assistance with your Facebook activity or any other aspect of your Social Media presence including your overall strategy, blogging, Twitter or LinkedIn use please give us a call. Fuzion provide Social Media Consultancy, one to one training and run courses for various organisations incuding the Enterprise Boards and the Digital Marketing Institute. Until next time.. keep liking !! This entry was posted on March 23, 2012 at 12:41 am and is filed under Facebook, Social Media, Training. You can follow any responses to this entry through the RSS 2.0 feed. You can leave a response, or trackback from your own site. Thanks Greg, that’s a really helpful post. A brilliant and informative piece dad! Thanks Greg, great post, very informative. you are very welcome Carol – good luck on the 31st !! delighted I could be of assistance – best of luck with your on-line endeavours !! Greg, one thing I cant seem to do – and I have migrated to new timeline now, not just preview mode – is rearrange the order of the tabs/applications. Trying to drag them but nothing happening…. Ahhh, you have to select the pencil icon and ‘swap’ position with another page. I was trying to drag the page (a function they allowed in ‘old’ Facebook). Feel better now….. This article is very useful and accurate. I have already migrated to the new timeline but I have learnt some good things through your article. So thanks Greg! The more I see of the new facebook, the more convinced I am that these changes will lead it to be a true marketing / business blockbuster. Thank you for all your help, this is brilliant and straight-forward.